Baltimore — For three days, hundreds of workers picketed, marched and rallied at Johns Hopkins Hospital on Baltimore’s eastside from April 9 through April 11, chanting, “Poverty wages got to go!” The community was elated and electrified. Car horns honked and passersby joined the picket line, including a group of high school students. “Baltimore is on strike!” declared John Reid, Maryland/D.C. executive vice presi­dent of Service Employees union Local 1199, at a rally following the three-day strike of 2,000 John Hopkins Hospital workers. “His words ring very true,” stated Sharon Black, a representative of the “We Deserve Better” Workers Assembly, who walked the picket line in support of the workers. She explained that Hopkins workers are the face of Baltimore; they are the working poor who make up the majority of this city. Nearly 70 percent of Hopkins workers make less than $14.92 an hour, a wage that qualifies a single parent and child for food stamps. 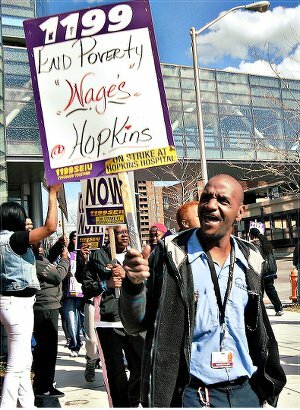 (hardshipathopkins.org) In addition, one-quarter of 2,000 service, maintenance and technical workers at Hopkins make less than $11.47 an hour — the poverty level for a family of four. Many workers make as low as $10.71 an hour and union organizers point out that some of the workers at Hopkins are homeless and live in shelters. Reid stated that Baltimore city’s median income is $30,000 a year and that many Hopkins workers make less than that, despite the fact that Hopkins touts itself as the number one hospital in the country. Hopkins workers on the picket line explained that the recent Maryland Legislature vote to raise the minimum wage to $10.10 in 2018 was far too little and too late for many workers. Most moving were the Hopkins workers themselves, who described the dangerous jobs they perform exposing themselves to needle sticks and Hepatitis C and HIV infections on a daily basis. Sammy Davis, an older worker, stated that he was on HIV prevention medication and that he only makes $12.95 an hour. An older woman worker with 19 years on the job broke down in tears as she explained that she was still living paycheck to paycheck and cannot afford to pay her bills. Wiley Rhymer explained how his family of four qualifies for food stamps because he makes less than $12.97. Along with speaking out on the picket line and at vigils, Rhymer and his two children are featured on www.hardshipathopkins.org. The workers are demanding a $15-an-hour minimum wage for workers with 15 or more years’ service in the first year of their contract. They are fighting to lift every worker to at least $14 an hour within four years. Hopkins hospital has refused to offer the workers anything approaching these demands, despite the fact that the hospital reports a $145 million profit on operating revenues. Workers have gone back to work while union representatives and Hopkins continue to talk. They assert that they can and will go back on strike if needed.